I'm new to this board you guys seem cool, I was wondering if anyone knew what colors to use on a full size vinyl chest burster model. I really want it to look like the face hugger from critters but have no idea as to what colors were used. any help would be greatly appreciated. Here's what I did on my face hugger,first off it's all Tamiya acrylic colours and I used an airbrush and brushes. First job was to clean the model in a light soapy solution of water to clean any release agent left on the model,this is important as any wax left on the model will prevent the paint from adhering properly,when dry it's prime time,I used a grey acrylic primer(spray) to fully coat the model( you could use white but grey will give a more realistic undertone for flesh). The next thing I did was buy some bog standard flesh colour mix with the appropriate amount of thinners then spray the whole thing in this one flesh tone(quite lightly) and leave dry. Now here comes the fun part,buy loads of gloss clear coat and the relevant shade colours for the job,I used a biege like brown that was a bit darker than the flesh a bit of yellow even pale blue(there's actually quite a lot of blue in flesh tones) and like Pretty'' said reds,white and any other colour you think might suit the job in hand. For the best results when applying your colours mix a bit in first to the clear gloss and use this as your medium building on layers of lightly coloured gloss coat will give it that translucent palid look,also use the tried and tested wash and dry brush techniques for hi and low lites and of course the best tool is your imagination so don't be afraid to experiment. thank you so much for the tips guys, your face hugger looks truely awesome. I'm gonna do one of them next if I have any luck with my burster. I'll let you all see how it turns out. Hey Witman,just out of interest where did you get you burster from and how much 'ya pay for it?? I paid 10 bucks for it from a place on-line called hobby warrior, he has the full size vinyl kits and quite a bit of others. all re-casts of course but there all around 10 bucks. That's really good value,I paid about �30 for mine,what's that about 50+bucks?? 10 quid! very reasonably priced indeed! with over night selivery! I don't have a real one to comapre with or nothing, but looking at my recast kit I think it'd be hard as hell for any body elses kit to have more detail. I dunno for ten bucks I'm bout as happy as can be with the quality of it the model. only thing generic box, no instructions and one little picture card for paint details, but it really isn't like any of that is needed I just wanted something to do during my insomnia fits. 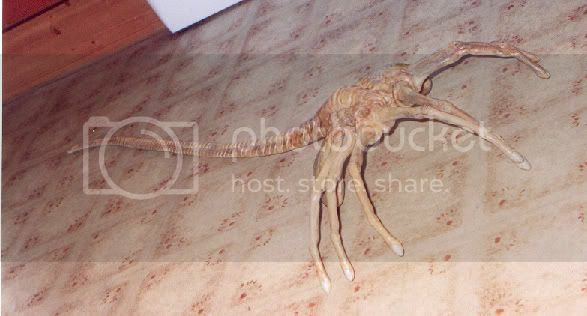 This pic is from the same place I got my face hugger,I'm betting your's is the same as this one,It's priced at �19.99 and they're recasts so you really do have a bargain! !